Lily Brazell is not your average seventeen year old. She’s the president of the Solar Car team where she helps maintain a solar car and races at the Texas Motor Speedway – they are 5th in the nation. Lily proudly proclaims that her life is “centered around engineering clubs.” She dreams of growing up to be an electrical engineer. Although Lily is anything but ordinary, she was surrounded by thirty-five like-minded high school girls as she stepped off of a school bus and onto Dell’s Round Rock campus last Friday. Lily was taking part in the Girls Who Code field trip day to Dell. Meredith Walker, co-founder of Amy Poehler’s “Smart Girls” organization jokes with GWC participants. Girls Who Code (GWC) runs a 7-week summer immersion program for junior and senior girls to learn coding, gain self esteem and obtain exposure to tech jobs. Dell’s commitment to supporting women in STEM careers, where they have traditionally been under-represented, extends to inspiring the future generations of females in tech through programs like GWC. 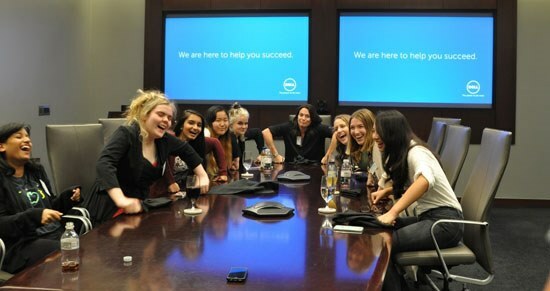 During their field trip to Dell, girls demoed Alienware products, attended an Alienware workshop designed to compliment their GWC curriculum, met Meredith Walker of Amy Poehler’s “Smart Girls” organization, participated in a diversity focus group, and were mentored by female leaders in technology from various Dell business groups. We sat down with two of our GWC visitors to chat about their experience at Dell, their future goals, and get their insight into the changing roles of women in tech. Why did you want to participate in GWC? I’m very involved with engineering. Engineering and computer science overlap some. Engineering at my school doesn’t involve coding so I wanted to take it this summer. It’s cool, I learned how to program my Arduino. I wanted to learn that and robotics. My engineering teacher, Mr. John Patterson. I am passionate about engineering because of his teaching. His enthusiasm shows through in his lessons. He’s a phenomenal teacher and I’m lucky to have him. What is the biggest challenge for girls wanting to pursue a career in STEM? Not being aware of the career opportunities and what they can pursue. I didn’t know it was an option until I met my engineering teacher. What’s a good way to attract more girls to pursue careers in STEM? More ways to let girls know these careers exist through programs like GEMS (Girls excelling in Math and Science). I’m passionate about GEMS. We convince elementary-aged girls to get involved in STEM and it's working. Girls also need to be introduced to more female role models. What was your favorite part of your field trip at Dell? During lunch, we had a speed mentoring session and I got to talk with Anna Maree Manciet, a producer and host for Dell’s Alienware brand. She was amazing. It was nice to meet someone in the industry that related to me so well. Plans after high school: My dream is to go to UT Austin and be in the Turing Program, which is the computer science honors program. What did you first think when you arrived at Dell this morning? It was very cold inside the building (laughs). The space is cool. It’s an intersection of what you think an office probably looks like and more modern architecture. The Dell employees we met were accessible and wanted to help us. It seem like they are doing something they really believe in. Animation or CGI work. Any joint between computer science and graphic design, like web interface. I like doing artsy stuff. Dream job is something like Pixar. What made you want to participate in GWC? I’m very enthusiastic about promoting equality between male and females. Being around other empowering women is something I wanted. I wanted to do coding in my summer. I didn’t want to just sit back and watch Netflix all summer. I wanted Web Development and Robotics. My dad, because he grew up in Vietnam and had to go through the struggles of the Vietnam War. He was separated from his family. Despite that, he went to college and got a masters in computer science. He has always been an advocate for me to get in the field. Empowering them to pursue what they want to pursue, whether STEM or not. Everyone should be involved in STEM because society is merging with technology. Also, women should want to be in STEM so they can stand up and become role models for future generation. Creating interpersonal relationships with younger woman who don’t have the support system, or who come from low-income families with no computers. 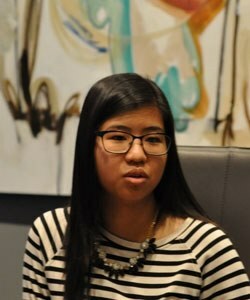 Having 1 on 1 connection and a mentor is important and pushes them toward a career in STEM. My dad is my biggest advocate that let me know I could do it. The lunch because it was informal and a conversation with a role model for us and a mentor. I really liked the informal part of it. They gave good advice that wasn’t just generic, it was real-life based. Anna from Alienware was my mentor and she was awesome!